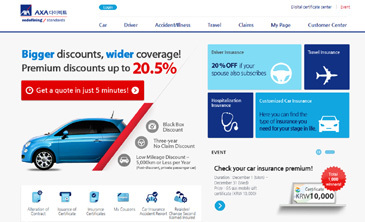 AXA Direct’s Global English Website opens. AXA Direct is providing “Global English website” service so that foreign customers can get insurance quotation and purchase products by themselves through website and mobile. The Global English website established by AXA Direct is the first website that enables foreigners in South Korea to get insurance quotes and to finalize insurance purchase by themselves for the first time in the industry. All process of insurance services from premium pricing to insurance purchase is offered in English, so even foreigners who don’t understand Korean at all can buy insurance product in five minutes. AXA Direct also has an insurance brochure in English and English-speaking claim consultants for foreign policyholders, in order to run the service more smoothly. They can freely choose or add insurance coverage in accordance with their own driving situation and behavior, and get specialized guidance regarding premium discount options such as mileage insurance and black box discount. In addition, they have newly set up an English service-specialized team and emergency and claim report call center (02-3479-3030). Therefore, urgent request for emergency roadside assistance and claim report will be immediately processed via website, mobile and exclusive call center. Additional inquiry on premium prices and insurance purchase will be handled by the specialized team via email, with even more detailed and kinder explanations. The number of foreigners living in South Korea now amounts to about 1.71 million, and they usually utilize basic banking transactions only. When purchasing insurance products, they cannot help but go through a number of difficulties because of language barrier and lack of understanding in products. Given this, it has been consistently pointed that foreigners need a specialized insurance service. As to this, the financial authorities have ordered through an official letter that the insurance industry shall secure foreign language-speaking staffers who can immediately serve foreign consumers or establish a management process with diverse foreign language supports. “We’re going to open an English Facebook page as well, so that our foreign customers can get more accurate information on diverse insurance benefits,” he added. The Global English website of AXA Direct is going to open on Feb. 2, 2015. You can visit the website by changing the language option on top of the official website (axa.co.kr), on the right side. The same service will be provided through the mobile page (m.axa.co.kr) and mobile application as well. Even if you don’t speak in Korean at all, There is no problem in purchasing AXA Direct insurance! One good case goes like this. A 32-year-old office worker Kim Dong-Sik is having difficulties because his American client is consistently asking for his help. When the client was purchasing a car insurance product recently, Mr. Kim had to do the interpreting job because the client cannot communicate with the insurance company in Korean smoothly. Moreover, a little later, it turned out that one of the special clauses the client meant to add was not included in the contract. Mr. Kim still can’t focus on his own task as he has to explain insurance terms and discount options to the client, even though he himself cannot understand them very well. A 40-year-old Jean Renault from France now works in Seoul. He visited several insurance companies’ websites in order to compare car insurance premium prices and purchase one of them, but ended up not buying any of them.